We just wanted to wish you all a Happy Christmas and Holiday Season, from all the team here at Moasure. Both we and our contract electronics manufacturer will all stay busy over the holiday period, to bring you your Moasure ONE just that little bit earlier. As a thank you to all of our backers, we’ve decided to make the Moasure app free to download over the Christmas period - it will be free from tomorrow, 22nd December. So for those of you who haven’t already tried the Moasure App, now's a great opportunity to familiarise yourself with it. Simply go to the App Store or Play Store and search for ‘Moasure'. But please, please remember that the motion sensors in your smartphone aren't as accurate as those in Moasure ONE. For that reason, you can only expect the measurement accuracy to be 2% to 3% when using the app without Moasure ONE. You’ll also find there are only 6 different measuring modes available when using the app without Moasure ONE (the other modes just wouldn’t be sufficiently accurate). Having said all that, I find it's great to have Moasure available in my pocket all of the time. 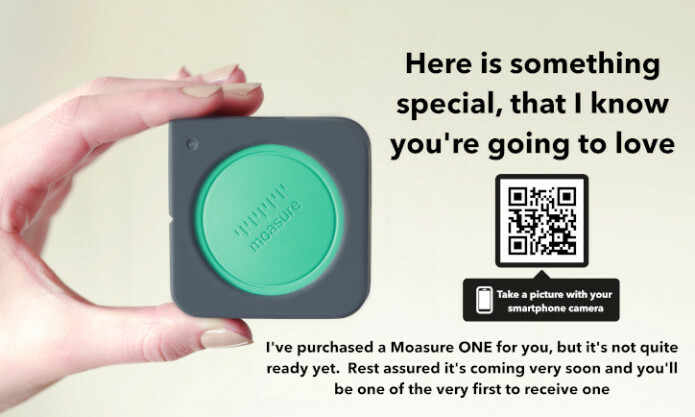 And if you try out the Moasure app now, when you receive your Moasure ONE, you’ll already know how to use it. Please let all your family and friends know they can download Moasure for free too. It would be great if you also share it on your social media channels.